I don't really know what's going on around here—last week's Magical Monday Moment was about Wrestlemania, and this week's is about baseball. Thank god RuPaul's Drag Race is on tonight so I can snap out of it. 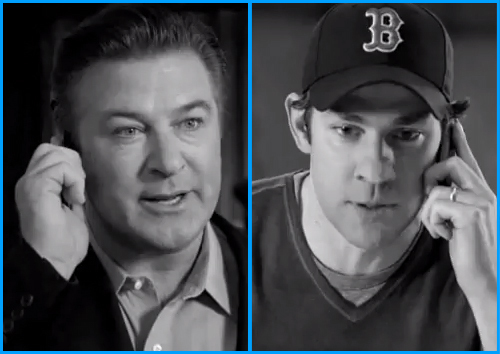 To promote their line of official Major League Baseball hats, New Era launched their "New Era Rivalry" campaign, pitting Alec Baldwin and John Krasinski against each other as they represent one of baseball's most heated rivalries: the New York Yankees versus the Boston Red Sox. Forget baseball, I would watch Baldwin and Krasinski in anything. This makes me want to go back and watch It's Complicated just to see these two together. To vote for either Team Baldwin or Team Krasinski, go to http://www.facebook.com/neweracaps. I had to represent my city and vote Team Krasinski (just make sure you don't tell my Yankee fan family).